Think you can do automotive advertising? 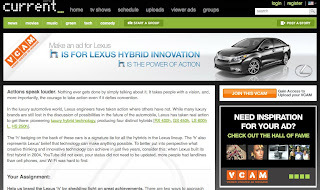 Lexus has partnered up with Current to have video content creators develop an advertisement for a Lexus hybrid vehicle. The prize is $2,500 for the winning VCAM (Video Created Ad Message) selected by Lexus. Plus the winner’s commercial will air on Current TV in the U.S.
Current has been doing these VCAM contests for about four years and this is another innovative effort with their advertiser/sponsors. The VCAM program is a way to get novice, semi-professional video producers engaged with brands in a new and innovative way. The marketing team is reaching out to film students and have held a couple chats on Current’s website to get people excited about the contest. Last week Lexus and Team One, Lexus’ creative agency, held a chat session with those interested in participating. You can listen to the chat via a MP3 file. There were about ten people on the January 8th call. I do love how the creative team and brand held open conversations with people who may be participating in the contest. It gives participants a chance to ask questions about what the brand is looking for and why the brand decided to do a unique approach like this. The approach also allows the creative to get more “unexpected” as one of the agency leads pointed out in the goals of the program during last week’s chat. Producers can do something that isn’t the typical car ad. It will be interesting to see how those not in the automotive industry will interpret an automotive product. It will be interesting to see if that nets something beyond what we all normally see in automotive marketing. Your VCAM should start with a sentence relating ‘h’ to your subject: ‘h’ is _____________” (e.g. “h is building a better mousetrap”) You do not have to use the Lexus ‘h’ icon. Incorporate the Lexus endtag below at the end of your VCAM. 60 second maximum (including endtag). Remember, longer is not necessarily better. Showing a Lexus Hybrid vehicle is not required. Upload deadline: Monday, February 1st at 12pm (noon) Pacific Time. Is the Buick Regal a Departure or a Band-Aid? The Lexus Superwoman Emerges, Sans Leather?